Our transformation is (nearly) complete! Check out our renovation gallery here! Want to see and share on Facebook? Do that here. 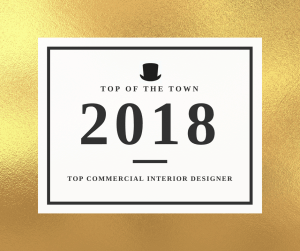 Top Interior Designer for Top of the Town 2018! We are excited to share that we have been voted as Columbia Business Times' Top Interior Designer for Top of the Town 2018! Thank you, CBT, for this awesome award and for giving us a chance to stand among the other "Tops" in the Columbia Community. Click here to see the "official" award. Stay tuned on future ITL happenings by signing up for our newsletter and by following our Facebook page.